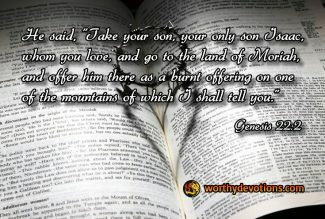 When Abraham is told by YHVH to offer up his son, Issac, the word "love" is spoken for the first time in the Bible. The Hebrew word for love is "ahavah". This first mention of "ahavah", which is the very nature of God [1 John 4:8] occurs in direct connection with sacrifice, the sacrifice of a most precious and beloved son. Abraham could not have known at that time that his obedient offering would foreshadow and typify the love of our Heavenly Father who offered up Yeshua, His only begotten Son 2000 years ago. 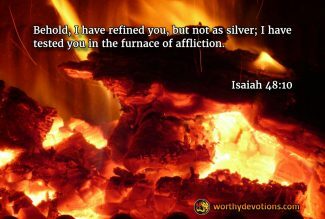 You are chosen in the furnace of affliction! 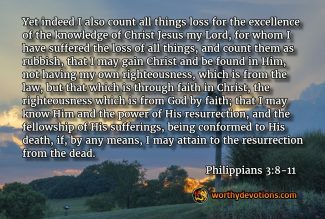 The great evangelist and teacher Charles Spurgeon had a plaque on his bedroom with the words written on it, "I have chosen thee in the furnace of affliction." 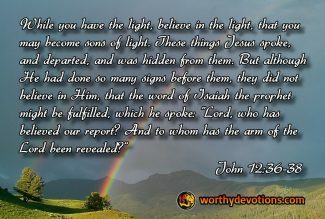 The apostle John quotes Isaiah 53:1, saying to whom has the z’roah [arm] of the Lord been revealed? 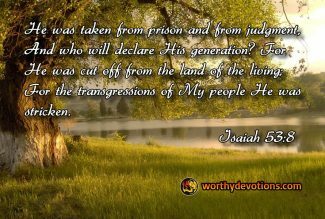 It’s a question that God answers throughout the rest of Isaiah 53, describing in detail the life of Yeshua (Jesus) and the ultimate price He would pay for the sins of the world. He understands our sufferings more than you know! 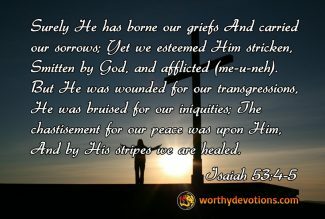 When I studied Isaiah 53 earnestly in the ancient Hebrew, I was taken back by the Hebrew word for "afflicted" (me-u-neh). In modern Hebrew this word means "tortured". When I was young, and first learned what torture actually involved, my soul was shocked that this could happen to people; in fact that it was happening to people. That a person could be kept alive for the purpose of intentionally causing him intense agonizing pain was an astounding enigma for my young soul. It really frightened me; and I think that fear of torture is probably the greatest fear that humans can experience. We read about people who have been tortured, with a kind of horrified awe. And quietly we wonder inside, "How can this be?" And, "Could this ever happen to me?" The Jewish leaders of His time rejected Yeshua (Jesus) when He first came. He didn't meet their expectations. 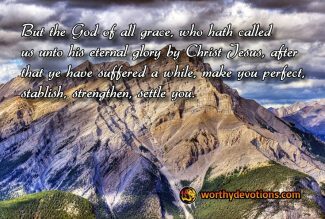 They were expecting a Messiah who would bring relief from the Romans, restore the Kingdom of David, and usher in an era of tranquility throughout the world. It is probable that their intense jealousy of Yeshua blinded them to the numerous passages in the Tenach (OT) which describe Messiah as a suffering servant, since they were certainly aware of those passages.